An Xyz Summon (pronounced ik-seez; Japanese: エクシーズ召（しょう）喚（かん） Ekushīzu Shōkan, abbreviated Ｘ（エクシーズ）召（しょう）喚（かん） in card text since Duelist Alliance) is the act of Special Summoning an Xyz Monster from the Extra Deck by overlaying at least 2 monsters with the same Level. During their Main Phase, the turn player can Xyz Summon an Xyz Monster from their Extra Deck by vertically stacking from their field, two or more face-up monsters with the same Level as the Xyz Monster's Rank, that are listed on it as Xyz Materials. After that, the player Summons the Xyz Monster from the Extra Deck in face-up Attack or Defense Position by placing it on top of the stacked Xyz Materials in an unoccupied Main Monster Zone that a Link Monster points to or an Extra Monster Zone. Monsters that do not have Levels, such as Xyz Monsters and Link Monsters, cannot normally be used as Xyz Materials for an Xyz Summon. However, some Xyz Monsters (such as "Number 100: Numeron Dragon") specifically list Xyz Monsters such as materials, in which case they can use Xyz Monsters as material. 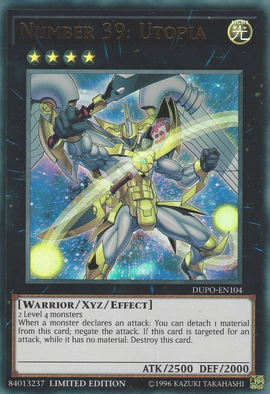 Additionally, some Xyz Monsters (such as "Constellar Ptolemy M7") specify in their card text that they can be also Xyz Summoned by using an Xyz Monster as material rather than their listed materials, in which case the materials from the monster used as material are transferred to the Xyz Summoned monster. Prior to the introduction of the Extra Monster Zone, a monster could be Xyz Summoned to any Monster Zone. Even if all appropriate Monster Zones are occupied, an Xyz Monster can still be Xyz Summoned as long as at least one of the Xyz Materials used is in one of these Zones, so that there is an available Zone when the Xyz Monster is Summoned. An Xyz Summon is a kind of built-in Special Summon, like Contact Fusion, Pendulum Summon, Synchro Summon or the Special Summon of a monster like "Black Luster Soldier - Envoy of the Beginning", therefore it does not start a Chain. Xyz Materials currently attached to an Xyz Monster are neither treated as monsters, nor treated as being on the field. Trap Monsters and pseudo-Trap Monsters can be used as Xyz Materials, but not Token Monsters, as Tokens cannot be in any state other than being on the field. The battle positions of the Xyz Materials do not matter, as long as they are all face-up. However, once you have Xyz Summoned your Xyz Monster, ensure that the entire stack is neatly aligned in face-up Attack Position, regardless of which Battle position the Xyz Monster is currently in. Xyz Monsters frequently have effects that require you to remove an Xyz Material(s) from beneath it, known as detaching. When this happens, the Materials are sent to the Graveyard. Some Xyz Monsters have negative effects if they have no Xyz Materials left beneath them. An Xyz Monster Special Summoned via any means other than an Xyz Summon will not have any Xyz Materials (unless given to it by a card effect, such as "Xyz Reborn"). 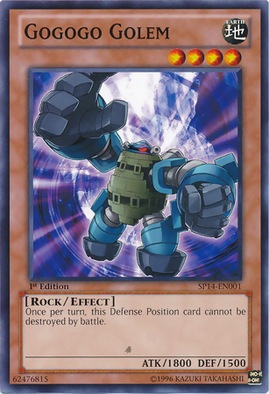 In this case, certain negative effects will apply immediately for some Xyz Monsters, such as those of "Number 17: Leviathan Dragon" and "Number 30: Acid Golem of Destruction". 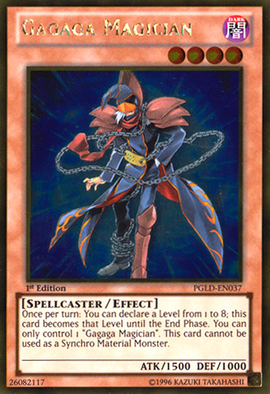 If an Xyz Monster leaves the field or otherwise ceases to be a monster (such as being treated as an Equip Card by "Destiny HERO - Plasma", or being treated as an Xyz Material by the effect of "Number 101: Silent Honor ARK" or for the Xyz Summon of "Number F0: Utopic Future"), then its Xyz Materials are sent to the Graveyard, unless the card effect says otherwise, such as those of the "Rank-Up-Magic" archetype. If an Xyz Monster is flipped face-down, its Xyz Materials remain attached to it. Xyz Materials are not treated as monsters, so they will not be affected by a card like "Dimensional Fissure". While "Dimensional Fissure" is on the field, detaching Xyz Materials still sends them to the Graveyard. If the Xyz Monster leaves the field, its Xyz Materials are still sent to the Graveyard, and if the Xyz Monster is destroyed, it will be banished while its Xyz Materials are sent to the Graveyard. If a card effect banishes all cards that would be sent to the Graveyard (such as "Macro Cosmos" or "Banisher of the Radiance"), then when an Xyz Monster leaves the field, its Xyz Materials will be banished. An Xyz Monster can still detach its Materials while such an effect is active; the Xyz Materials will be banished instead of being sent to the Graveyard. Apart from the basic method of performing an Xyz Summon outlined above, certain cards allow the controller to perform an Xyz Summon outside of its parameters. Usually through "Rank-Up-Magic" cards or "Xyz Evolution". A standard Xyz Summon in ZEXAL. In the anime, using monsters as Xyz Material to perform an Xyz Summon is referred to as overlaying them. 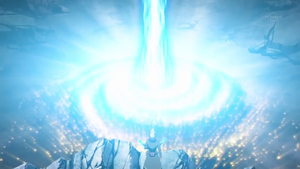 When an Xyz Summon is performed, the Xyz Materials turn into forms of energy whose colors match their Attributes before shooting into the air, sometimes spiraling around each other. 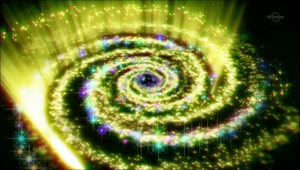 A swirling portal known as an Overlay Network then appears, and the energy forms enter the portal. The newly Summoned Xyz Monster then emerges from the portal, its Xyz Materials, now colored in accordance with its Attribute, orbiting around it as spheres of light that leave behind fading trails. The Overlay Network of the "Number" monsters, which also serves as the stardard one in ARC-V. The appearance of the portal differs between Yu-Gi-Oh! ZEXAL and Yu-Gi-Oh! 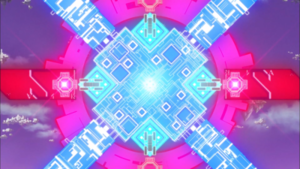 ARC-V; in ZEXAL, the portal is usually a simple red vortex that twists shut and explodes in multi-colored light, but certain monsters have unique or specially designed Overlay Networks of a different color or design. The most obvious example is the "Number" archetype, which employs a more gradiose visual of yellow particles over a dark purple nebulosity, forming a distinct spiral shape highly resembling a stylized galaxy. This animation is likely a reference to a statement from Konami that says Xyz Monsters entered our universe through a black hole. An Xyz Summon in Yu-Gi-Oh! ARC-V; a blue pillar emerges from the portal rather than it closing. 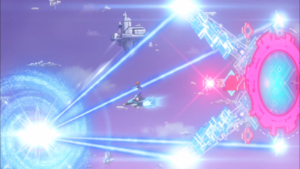 Interestingly, all Xyz Summons in ARC-V used this "galaxy-style portal", although compacted in size, as well as replacing the "shutting and exploding" effect with a simpler pillar of blue energy erupting out from the center. Subvariations exist, such as "Odd-Eyes Raging Dragon" producing red energy instead. Of note, an Xyz Summon performed using monsters that have been Pendulum Summoned is referred to as a "Pendulum-Xyz Summon", and Shay Obsidian also refers to an Xyz Summon performed using both an Xyz Monster and a non-Xyz Monster as materials as a "Cross Xyz Summon". Overlay Units in an array before being used to create an Overlay Network. In Yu-Gi-Oh! 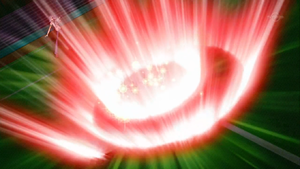 VRAINS, the entire sequence is remade: when the Duelist declares that they are overlaying their monsters, lightning crackles from them before a blue X-shaped cybernetic array (somewhat similar in design to the Link Summoning Circuit) with four small red circles between the spokes materializes behind them. The Xyz Materials disperse into coloured particles and enter the red circles and once they are set, datastream-like energy flows from the tips and forms the galaxy-style Overlay Network, now entirely colored light blue, from which the newly formed Xyz Monster emerges. The process is reminiscent of a sci-fi device being used to open a wormhole. When Xyz Summons were revealed in the OCG, they were at originally translated by fans as "Exceed Summons" by fans. This was likely because "Xyz" is not an actual word and has no immediately obvious pronunciation. The word "Exceed" was likely the closest English equivalent to the Japanese エクシーズ Ekushīzu. In the Chinese OCG, the term for "Xyz" is 超量 Chāoliàng, which means "Exceeding".